If you don’t want to read yet more glowing praise for this outstanding addition to the Oppo range, which was announced here at Witchdoctor back in May, then look away now. It had been quite a week for me in hi-fi land. First, I had been told by several dealers that my more than 6000-CD music library isn’t worth much money anymore, then this music player arrived for review. When a reputation precedes a new model, certain expectations are raised, so this is a simple tale of ‘familiarity breeds fascination’. I heard lots about the UDP-205, I lived with one for a few weeks courtesy of Interdyn NZ, I loved it. The value proposition is simple – OPPO do what they have become famous for, and raise the game a few notches. So what’s the big deal? This sight and sound player is of particular interest because of the very impressive specifications (>120dB dynamic range for starters! ), but also because it uses the same digital to analogue converters as the intriguing Oppo Sonica DAC, which sadly is not yet available in the NZ market. 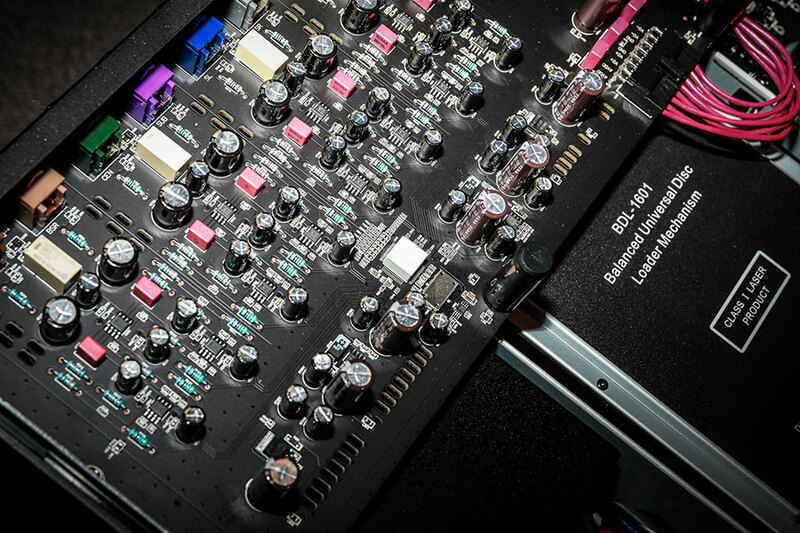 The Oppo name has quickly garnered high praise from figures like hi-res recording pioneer David Elias, and to say that the UDP-205 is lavishly featured is to undersell this surprisingly-priced high performance ‘multi-component’. In a single case sit four integrated devices, each with considerable merit in themselves, and in combination, this is a real winner. This is no simple ‘universal player’, because we’ve got audio, video, networked and attached media players, and DAC/pre-amp. There, I’ve revealed the punchline. Now let’s take a look at what you get, then I’ll tell you about my listening and viewing experience of what it does. Hold onto your hat, it’s quite a ride through the features and capabilities. This is where it gets serious, because there are so many features and functions. Basically, this model is a supercharged upgrade hot on the heels of the UDP-203, with universal disc player, file streamer, DAC pre-amplifier, and souped-up headphone amplifier. For audiophiles, it’s a digital audio source with great video performance. The video performance is no less impressive, especially when partnered with outstanding audiophile sound quality and format capability. A long list of specifications reproduced here from the website seemed pointless, so instead I directly approached my audition from the point of view of a user, and set out to find out what’s inside the case, and what I could do with this unit. The clues are on the remote control device and the back panel. Immediately, it’s obvious that this is more than one product integrated into a very comprehensive player. It’s housed in a black box, and at first glance it appears to be rather conventional, conservative, even ordinary. The brushed aluminium fascia is understated. But my sense of “nothing special here, move along” was soon dispelled just by scanning my eyes over the array of connectors. It isn’t only a high performance audio disc player, nor is it only a high definition video disc player. Does it only play discs? Despite the name, this unit can be used to play discs of various formats, but it can also be used as a media hub and also as a DAC and as a pre-amplifier. Now that’s quite some value proposition if the performance is on par with previous models. In the audio section there are analogue stereo audio outputs in both RCA unbalanced and XLR balanced (for better noise rejection and signal integrity), and both optical and coaxial. There are several digital audio inputs – optical, coaxial, USB DAC – and the unit can operate as a dedicated DAC, outputting to the stereo RCA and XLR sockets. There are two USB 3.0 sockets. For video, you get HDMI output, HDMI audio, HDMI in for connection of a TV set-top box, cable/satellite, games console or other Blu-ray player. You get 7.1, 5.1, and 2.0 (stereo) analogue audio out. Connectivity is impressively comprehensive: RS-232 serial control for home theatre integration, internet via Gigabit LAN Ethernet or Wi-Fi, including BD-Live associated with Blu-ray disc play, and firmware updates. This gave me pretty much instant access to all of the media files on the devices connected to my home network. I was able to play FLAC music files from my PC as it was recognised as a DLNA server (I run JRiver Media Centre). There is also a USB 2.0 input on the front panel for easy media file playback from USB flash drive and other devices. Like other Oppo products, the UDP-205 is designed in the USA and manufactured in China with a simple and stylish brushed aluminum front panel and a double-layered metal chassis (42.7 x 31.0 x 12.2 cm). Not immediately evident is the care taken to treat vibration. The double-layered metal chassis is very rigid, and is fitted with substantial isolation feet, each to enhance stability and vibration-canceling capabilities. The perforated top ensures cool running. Very high-grade components are used throughout for this impressive machine. 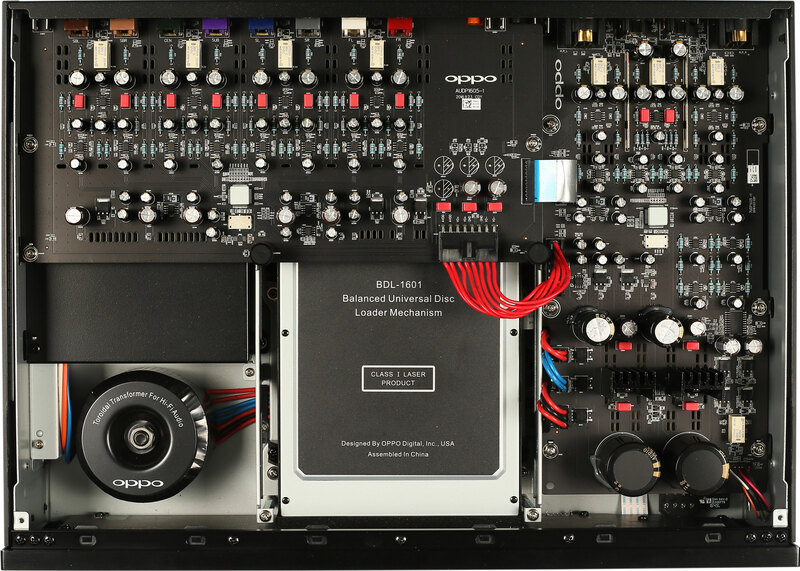 The Oppo has separate power supplies for digital and analogue circuitry to eliminate virtually all harmful interference. The analogue audio section is powered by a massive toroidal power transformer, which provides superior efficiency and significantly lower exterior magnetic field interference compared to traditional laminated steel core transformers. The toroidal linear power supply provides a very clean and robust power source to the audio components. Through the perforated top panel I can see the custom/bespoke Oppo balanced universal disc loader/carrier mechanism. The 4K disc loader features an optimized laser mechanism that delivers super-fast disc loading, compatibility with a wide range of optical media, and strong error detection and correction to ensure error free physical media playback. In use its action is reassuringly solid and quiet. 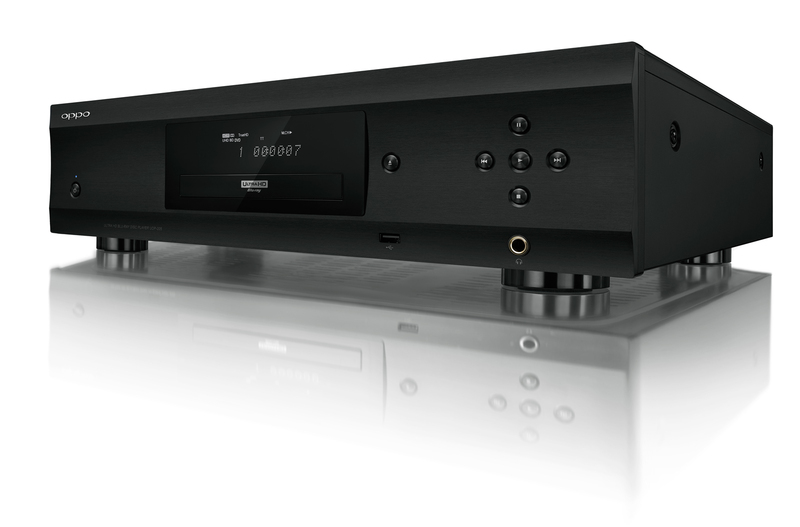 At the heart of this machine it’s an audiophile universal disc player providing lossless, high-resolution audio, designed to be best-in-class audio performance, employing ESS ES9038PRO Sabre Pro DACs. As the flagship of the ESS series, the ES9038PRO sets a new benchmark for audio excellence with its best-in-class 140 dB dynamic range. This unit has two 32-bit HyperStream DACs for both stereo audio output and 7.1 channel analogue audio output. It plays 4K UHD, Blu-ray, 3D, DVD, DVD-Audio, SACD and CD. Impressively, analogue stereo output is claimed to have a frequency response of 20 Hz – 160 kHz (! ), with a signal/noise of better than 120 dBr, and Total Harmonic Distortion of less than 0.00018 per cent. Design enhancements on previous models have resulted in what Oppo describes as ‘reference level sound quality’ through the analogue outputs, as well as improvement on the clock precision of the HDMI audio output, and increased power from the built-in headphone amplifier. The high-stability, high-precision HDMI clock and a special HDMI audio jitter reduction circuit significantly reduces jitter and eliminates timing errors, allowing music playback with increased accuracy through the audio-only HDMI output port. An asynchronous USB-B DAC input supports sample rates up to 768 kHz PCM and DSD 512, which are capable of playing files and discs to all current DSD decoding standards. Audio format support has been expanded to multi-channel DSD64/128, as well as 192kHz/24-bit PCM used in high-resolution lossless formats such AIFF, ALAC, APE, FLAC and WAV. DSD64 is played back in native mode or converted to PCM, while DSD128 is converted to PCM. The Pure Audio mode reduces any potential interference between the video and audio signals by turning off the player’s video processing and output. My interest is mostly in the audio playing capability, so I focussed on stereo playback of CD and SACD, and playback of FLAC music files over my home network, but let’s not miss the fact that this is a serious visual player too. Oppo worked with MediaTek to produce a specialized 4K UHD Blu-ray decoder chip – the quad-core OP8591 – which provides the most advanced image decoding and processing technology available for 4K UHD Blu-ray, Blu-ray, DVD and user generated media formats. The UDP-205 is capable of playing the new 4K UHD Blu-ray discs as well as 4K media files. Support for decoding the HEVC, H.264, VP9 4K, and Hi10P video codecs provides increased compatibility with user generated media. The new 4K UHD format includes high-dynamic range (HDR) video and an expanded color range, for more natural and true-to-life colors. The UDP-205 supports the HDR10 format, and it is also capable of providing an accurate conversion from HDR to SDR for older displays. Support for Dolby Vision will be available in the future via a firmware upgrade. The UDP-205 is capable of upscaling lower resolution content up to 4K Ultra HD, which is four times the resolution found on a 1080p Blu-ray disc. The UDP-205 also has advanced picture controls. Adjustments can be made to brightness, contrast, hue, saturation, and sharpness, allowing you to make adjustments to compensate for any limitations found in your other home theater components, or to adjust the image to your own personal taste. It supports up to 4K@60 resolution with native 4:4:4 Color Space, and all current SD, HD, and UHD resolutions, including 4K@60p, 4K@50p, 4K@30p, and 4K@24p using various color spaces such as PC RGB, Video RGB, YCbCr 4:4:4, 4:2:2, and 4:2:0. The UDP-205 is able to play all universal disc formats, such as 4K UHD Blu-ray, Blu-ray, Blu-ray 3D, DVD, DVD-Audio, SACD, and CD. It has extensive media format support such as MKV, AVI, MP4, WAV, FLAC, APE, DSD, etc. It also supports connected USB hard disks and thumb drives, and has the ability to access content from DLNA servers and SMB shares over the local network. 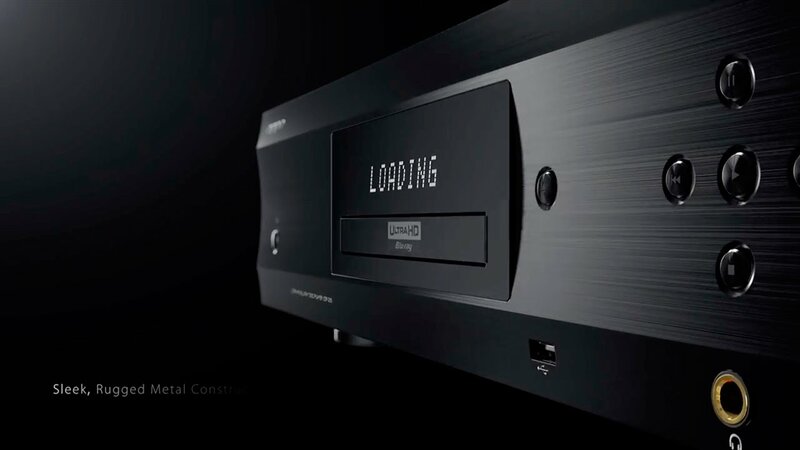 In addition to supporting the Dolby TrueHD and DTS-HD Master Audio surround formats, the UDP-205 supports bit-streaming the latest object-based surround formats, Dolby Atmos and DTS:X. These new formats add overhead sound effects to create a greater impression of 3D-dimensionality! The newly updated high-resolution user interface has been designed to be incredibly convenient to navigate, and provides an easy way to manage and access media files from both local and network storage. The UDP-205 is easy to integrate into any system due to its ability to receive standard IR, RS-232, Oppo-produced UDP-20X MediaControl smart device application, third party IP Control system and HDMI CEC commands. The player also supports Trigger In and Out, so it can automatically turn on and off other connected devices. Wow!! Now we’ve made it through the technical stuff, just how well does this all play out in the audio and video performance when playing music and movies? Oppo have earned an enviable reputation for high performing products through a series of models, and this one is the latest evolved sibling, so I knew what to expect. I wasn’t disappointed. The thing that struck me on playing the first audio disc was the sheer presence of the recorded music reproduced – from very quiet to very spacious and richly detailed. This unit delivers audiophile analogue sound quality, no doubt. My movie pictures were crisp, clear, with bright, vivid colours, even on my modest TV. There are some notable things to mention. It’s a substantial piece of kit (10 Kg), as is the unusually heavy remote control unit (it weighs in at 205g, compared with the wee remote for my trusty Pioneer D6 SACD player which weighs just 50g). Actually, it turned out that I didn’t receive the correct remote for this model, but nonetheless it performed admirably, providing ‘soft’ control. By that I mean there is a smooth transition when the start, pause and stop buttons are pressed. The user manual is downloadable as a PDF file from the website, as is the USB DAC software driver. 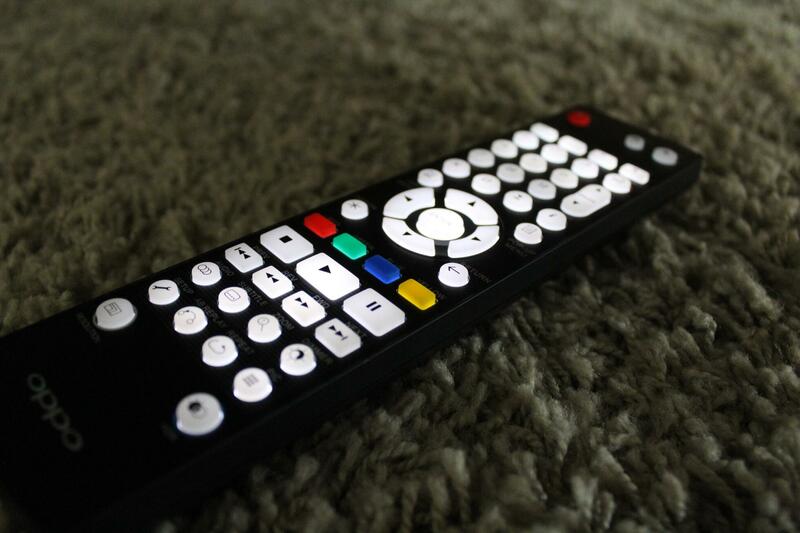 The Oppo UDP-20X remote control app for iOS browses media file libraries, controls playback, switches power on-off (if you have the correct Firmware version), accesses full setup options, and has a neat virtual remote control. There’s also an Android app, and the correct remote handset has a motion detector that senses when it is picked up for use (although I was unable to try this as it was not supplied for the audition), as well as illuminated keys for those sessions in a darkened room. So, what’s my overall impression from using this machine? There’s a palpable sense of calm capability when using the Oppo UDP-205. Operation was surprisingly simple and intuitive, despite the extent of options. There are no hang-ups, delays, judders, or skips. It’s operation is refined, competent, and heavily featured. This is a very serious performer as an audio player and a video player using diverse media and connectivity. Add a great amplifier and loudspeakers, and HD TV, or home theatre system, and this could be the heart of your media playing needs, and then some. Crown that with ‘ultra’ definition in both sound and vision. Although this 4-in-1 is hardly intended to be an entry level machine, I think that sheer value-for-money is packed into this impeccable product. I would seriously be tempted to buy it if in the market for a player that will do justice to a substantial and cherished disc collection investment as well as enabling easy file streaming. The folks at Oppo clearly don’t think discs are dead just yet, and they also see that users want network streaming and flexible media connectivity. To balance my gushing praise for this product, I tried to identify something I didn’t like about it, without success. Yes, the price is high, and the simple restrained style of the case is just a wee bit too conservative for my taste. Yet, when you’ve lived with this machine for a while, it’s obvious that functionality and performance are the focus and ostentation in design is intentionally absent. Price is certainly not high for what you get. But the numbers are now quite silly for home use. 4K is history already and 8K beckons. This goes beyond our visual capabilities and is only relevant to screen size. It’s probably why no one has felt let down at the best movie theatres in the past. “For comparison purposes, 70mm film – still considered by many to be the gold standard – is roughly equivalent to a 12K resolution in digital terms, so digital’s still got some catching up to do on that score. IMAX demonstrates this difference rather well : it can be used with 70mm film as well, but when recorded digitally, the screen resolution is only 2K or 4K. It’s the huge screen, powerful magnification and other tweaks that make the IMAX experience so immersive”. So true having visited Imax (when alive in Auck) and Melbourne. And 35mm film equates to 4 – 6K believe it or not. As for Audio, again the numbers are equally silly. There is no 768 kHz PCM music. We are into sonar territory – even bats peg out at 120kHz and whales at 200kHz. Mind you, I’m intrigued to find out just how far the ‘techno boat can be pushed out’ – before the levee breaks – and people cotton on ! I was looking for a Samsung essamhtf 9730 then I saw your model review. Do you still sell them or know who does. I then saw a Samsung theatre system for 1499.oo is one still in stock. And where are you located and phone number. And the dvd player opps I. saw it on Amazon for 1099.00 $ thanks.